Diana MacLellan, Teacher, Trainer, Coach, Hypnotherapist, NLP. Diana MacLellan was born in Windsor. She comes from a military family, and spent a lot of her childhood living abroad. At one stage she lived at The Tower of London, where her father was Governor. This background prepared her to adapt easily to new situations and to be at ease in any company. It also gave her a deep interest in foreign cultures and she enjoys travelling to distant and unfamiliar places which offer different perspectives, giving her insights that she can often use to good effect in her work. She had a career in MI5 and it was here that she first began to develop her observational skills. On leaving the Security Service she trained as a Teacher of The Alexander Technique. She had the good fortune to work for many years with Dr Wilfred Barlow, the leading medical exponent of the technique and his wife Marjory the niece of FM Alexander at The Alexander Institute. Diana has been teaching for over twenty years and now runs her successful private practice in Chelsea. Her interest in teaching, learning and presentation skills lead her to become a Trainer of NLP and a qualified coach. Diana now specializes in Body Talk, the art and science of applied body language. Diana tailor-makes her sessions and workshops to suit the particular requirements of her clients. She works internationally with a wide variety of clients, both individually and in groups. Diana is a Freeman of The City of London and Liveryman of The Worshipful Company of Fletchers. She is also a Fellow of The Royal Geographical Society. She qualified as a Teacher of The Alexander Technique in 1987 and is registered with the Society of Teachers of The AT. She became a Certified Trainer of NLP in 1996. 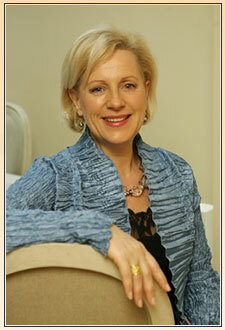 She became a Certified Hypnotherapist (American Board of Hypnotherapy) in 1995.